Roy Arnott of Reservoir spoke for Melbourne: ‘[He’s] like a dog urinating everywhere to mark his territory.’ Arnott had written to the Age about a graffiti tagger who’d painted over a feminist mural, 30 years old, in inner Melbourne’s Smith Street. There’s street art and there’s tagging: art’s good, tagging’s not. This much is generally agreed in your standard conversation about graffiti, even in graffiti-friendly Melbourne. Scrawling your name, or your nom-de-can, on a wall is not art. How, then, to explain the midnight career of NOST? In January, when NOST capped, or painted over, the Smith Street mural in letters five or six metres high, I’d already spent weeks photographing his work, becoming increasingly obsessed with him. So while I shared in the disappointment at the mural’s loss, I couldn’t quite join in the general mood of condemnation. ‘NOST is a dickhead’ was soon scrawled across the ruined mural, as well as a fair bit of the internet. I can’t dispute that. But he’s an interesting dickhead. ‘You’ll get outlined in chalk’: a nice turn of threatening phrase, I thought. Then, as happens with obsessions, I started seeing NOST everywhere—on walls and overpasses, high up on unreachable billboards. This guy is game, I thought. One day, procrastinating, I googled him. I found a page—not his own—describing him as ‘mostly into throwies’, and a few photos of his pieces. On Instagram there were a bunch of images hashtagged ‘#NOST’ by various posters, and that was about it for information. Vague interest turned to something keener when, coming home one afternoon, I read the word NOST on a pole in the lane behind my house. He was right here last night, I thought. Almost to confirm to myself how many of the things there were, I started photographing his ‘throwies’. Mostly they just read ‘NOST’, but of course it’s not that simple. It’s not about the word itself. As the mother of two children, my rounds in life are fairly limited. Early most mornings I escape for an hour to ride my bike along back streets and the paths that run beside Melbourne’s rivers, creeks and train lines. This gives me a lot of opportunities to see graffiti. The centre of my orbit is roughly the intersection of Brunswick, Northcote and Fitzroy, with a deviation down into the city of Melbourne. 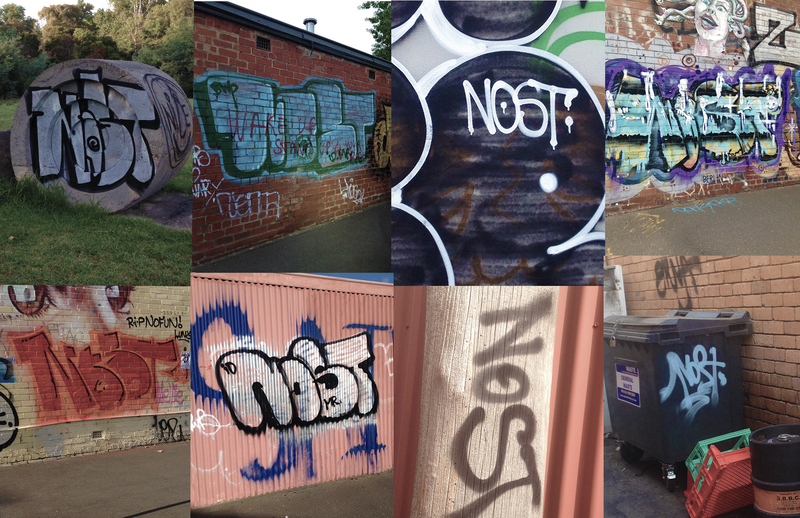 I don’t know what NOST stands for, but I guess the first two letters may refer to the north of Melbourne. NOST and I inhabit the same physical, if not social, world. After only a few weeks, I have nearly 300 individual NOSTs on my phone, and I’m questioning the idea that repetition is tedious. Cumulatively, examined closely—and the more carefully I look at anything the more interesting it becomes—NOST’s work is a sort of cross between Andy Warhol’s soup cans and the thousands of iterations of ‘Eternity’ Arthur Stace chalked on Sydney’s streets in the early twentieth century. The elements of this significance have only revealed themselves with the exercise (quite literally) of viewing the massive installation ‘NOST: Melbourne’. The photographs are not the point. They are flat, digital and out of context. They don’t include, for instance, the cars speeding past; the cobble­stones of the alley beneath my feet; the vertigo implied in a NOST sprayed a metre below a billboard five storeys up. They don’t include the early-morning bleariness I felt the day I ‘collected’ 20 or 30 NOSTs in Northcote before 6 am, or the sense of the hunt I’ve developed as my collection has grown. Real hunters, bless their murderous souls, talk about pitting their wits against their prey. In other words, when they figure out how to find the thing they want to kill, they feel clever. So it was with me. Knowing nothing about graffiti culture, I had nothing to guide me except his art. He has attracted none of the commentary that follows the ‘street artists’ whose murals are treasured and who are courted by real galleries. Instead he’s considered a mere tagger. His work appears in the usual places—off Hosier Lane and so on—but also on streets where tourists never go. All there was to know about NOST, I had to get from his work. After six weeks of ‘reading’ him, I know these things: Where there is a PORK, there will also be a NOST; good NOST locations include roller doors at the end of laneways that face out to main roads, and lanes that run parallel to main roads; NOST has a sense of humour. Sometimes PORK does a piece and either at the time or later, NOST caps it. When he did this once in Swanston Street, he made sure to ape PORK’s style with a little dot in the centre of the ‘O’—a little echo, a visual joke. (PORK seems to be everywhere too, in oversized tags the size of a small apartment, and at some point PORK was joined by, or became, LAMB.) An outbreak of violet-hued characters told me when NOST and his mates had acquired a batch of purple paint. After these weeks of discovery, I’ve realised that the search is effectively endless. I’ve become a collector, and collectors are fascinated with the slightest variations, the finest-grained details of their subjects. It’s a kind of essentialism. Every NOST is different and the same, as every antique clock or Picasso or teddy bear is different and yet recognisably a clock, Picasso or teddy. NOST in monumental, Ben Hur letters painted as if built from ancient stones is the same as NOST built out of jaunty skeletal sections, and yet it’s a new thing entirely. NOST dripping with white highlights is street-cool, NOST hastily sprayed ten times over on a park fence is an artist’s note-to-self: yes, still working, but no time tonight. Once I saw an outline where a NOST had been scrubbed from an iron wall and this lost NOST had something to say to me about ephemera. The tags took on the quality of messages from the night, signs of what had happened while I was sleeping; one NOST literally became LOST on a Thursday night when some brave antagonist overwrote the ‘N’ with an ‘L’. In parts of East Brunswick I couldn’t ride more than a few metres along a main road or laneway without having to stop and take another photograph. It seemed he was throwing them up faster than I could photo­graph them. Around that area—mostly in Lygon Street North and its intersecting arterials—urban renewal, aka rampant development, has pockmarked the streets with building sites papered over with timber hoardings. The building sites are deep and large—never single houses but always 12, 20, 50 and even 200-apartment jobs that begin with a massive pit to house the underground car parks and deep foundations. The sides of the pits are raw-scraped stone and the cliffs these form extend straight up to the height of the adjacent buildings, often two or three storeys themselves. Here, and in the shells of yet-to-be demolished factories and warehouses, the graffiti artists find huge canvases to work on, canvases no-one really minds them using. They use fencing panels, mattresses and old shipping pallets to build makeshift painter’s scaffolds, and they write their names big and bold. And most of it is invisible to everyone who passes. I see it only because I’m searching it out, and this is something else my NOST obsession has given me: a new view of the streets I travel along. He’s taken me to places I would never otherwise have gone to. These locations and others behind bushes, on the underside of Yarra bridges, on the insides of dark doorways, can’t really be markings of territory. Who is he writing for? Other artists? Or does he just write his name a thousand ways because he can? Often the graffiti is on the inward-facing boundary walls surrounding a new building. Here and there I find a NOST or another artist’s piece half obscured by scaffolding, and I see that it will still be there a hundred years from now, to be revealed when today’s new apartments are torn down to make room for whatever comes next. There’s a NOST sprayed on a piece of shade cloth fencing on a building site near my house. I’ve considered going down there with a Stanley knife and souveniring it. But like a Banksy in an art gallery, it would be something different once I brought it home. I thought I was the only one (apart from the Instagram graffiti fans) who’d noticed NOST. Then at the peak of my interest, he destroyed the Smith Street mural and for his 15 minutes of fame was public enemy number one, with calls for his arrest and a reasonable amount of online abuse. I wondered why he goes beyond empty walls to capping existing art, and if it disqualified him as an artist. The legal line on tags—on any street art, however aesthetically appealing—is that it’s an issue of consent. The owner of the surface that is painted must be okay with it. A police officer on the Smith Street case told me this was the difference between a criminal offence and behaviour of no interest to police. And capping—which NOST has done to at least two other authorised public works—is considered downright rude among street artists. NOST once wrote up a wall with the words ‘I promise for the rest of my days not to cap NOST’ in school blackboard lines style, but he does it himself, often and loudly. Two artists created the Smith Street mural, basing their images on real women’s lives and one told a reporter that ‘We don’t really care … it was very badly damaged anyway across the bottom because of many years of graffiti, it was never really looked after’, but that she was sorry for its subjects and their stories. She was right—the mural was already faded, overwritten and neglected, but others NOST has capped were brand new and beautiful. Most graffiti writers follow other tacit rules. Public property, starting with anything related to trains and roads, is most likely to be written on, then the unused sides and rears of commercial buildings. Empty shopfronts come next, then the back walls of private houses in laneways—roller doors and fences. Trucks parked in one place too long are sometimes hit, but rarest of all are the fronts of private houses and private vehicles. Even NOST, as far as I can tell, hasn’t stooped to tagging the family car. All the same, he’s the outlier whose actions reveal the unspoken boundaries everyone else was keeping to. If I could meet him, I could ask him why, but he has no visible online profile, and short of lurking in a garbage skip every night at three o’clock, hoping he’ll come along and tag the side of it, I don’t think I’ll ever get the chance. Further south, I noticed a grand Victorian terrace for sale. Its signboard wasn’t NOSTed (as he crowed in one tag: ‘U got NOSTed’), but it did feature a stately living room decorated with large canvases, one of which looked like it was by high-priced Indigenous artist Rover Thomas. Art as commodity: the antithesis of tagging. NOST may not have thought this through. But in his actions, he’s rejecting the conventions around street art. He’s not doing what’s sanctioned. His work isn’t usually pretty, though it can be. To consider him an artist tests to the limit the proposition that art must spring from the artist’s desires and not exist only at the audience’s pleasure. He’s certainly a dickhead for using his long rollers and paint cans to cover that mural—all those women’s faces, all those stories—but I don’t think he’s out there every night painting because his own life is a bed of roses. One Facebook commenter claimed to know that NOST was a ‘meth head’. A graffiti blogger launched a spirited defence of NOST that reproduced a few comments he’d written on walls: ‘for my art teacher that gave me an F’ and ‘sometimes I hear death nocken [sic] at my front door’. His urge to claim the streets is his own, of course, but it could also be read as being on behalf of the meth heads, the unemployed, the marginalised, or just those who want the streets to be a place of freedom. I hesitate over whether the might of the state should come down too hard on that. So I tie myself up in intellectual knots—capping is bad, but so is a world without the freedom NOST grants himself. He’s dis­respectful, criminal, but still interesting, still intervening in an ordered world in a way that gives me a jolt of sly complicity every time I see a new work, which is every day. I think, I may not agree with what you spray, NOST, but I’ll defend (maybe not to the death) your right to spray it. Criminologists take these questions seriously. In one 2006 Australian study, researchers concluded that ‘writing’ tags was about more than just getting a name on a wall—it was about community and about forging a physical connection to the city. Boredom, rebellion and racking up status also figured, but the sense of interacting with a place, whether by meeting the challenges of accessing a difficult location, or by the movement of the spray can over the walls, gave the writers a sense of meaning and ‘corporeal pleasure’ too. ‘[Graffiti] writers perceive the urban landscape very differently from non-writers,’ the researchers wrote. And, I’d add, by their ‘writing’, they force the rest of us to acknowledge that perception. Where parkour leaves no trace, graffiti is the trace of a very different world, insisting that we notice it. Soon, I’ll be over NOST. I know it by the mix of amusement and dismay I feel when I see yet another one and am compelled to stop and photograph it. Obsessions and addictions are incompatible with ordinary life. But for now, there are new locations to check out. There may be new variations, new lettering, new jokes, new feats of access. There are NOSTs on trucks parading his name through city traffic and into the suburbs, jumbled NOSTs, NOSTs in surprising places that make me laugh with their audacity and, just before Valentine’s Day, a ‘from NOST with love’ that I photographed, then waved under my son’s nose as proof that NOST himself was sending me messages. When my son told me it was ‘weird’ to stop the car to photograph a tag, that I was getting out of hand with this thing and should drop it, I replied: ‘I’m taking an interest in the world around me.’ NOST has made me look again; isn’t that what art is supposed to do?